The Russian Government has decided that state-owned United Shipbuilding Corporation (USC) may buy control of Novorossiysk Shipyard (NSY) from the Novorossiysk Commercial Seaport Company (NCSP), which is currently in the midst of bitter conflict between state shareholders and Ziyavudin Magomedov (picture, right). 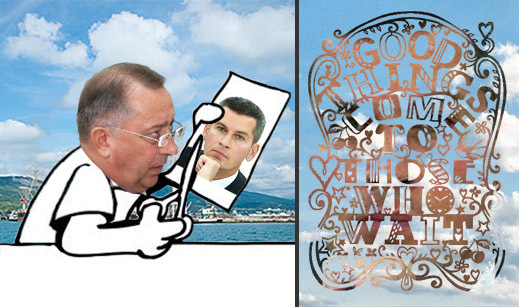 The takeover has been promoted by Dmitry Rogozin, deputy prime minister in charge of the military industrial complex, as a solution to the ship repair requirements of the Russian Navy whose operations are growing fast in the Mediterranean, as well as the Black Sea. The takeover move is also backed by Transneft, the crude oil pipeline company, and Russian Railways, which already control about 41% of NCSP’s shares; and by Rosneft, the state oil exporter, which is bidding to acquire the remaining 20% stake which the state holds in NCSP. A beneficiary of their alliance is Gennady Timchenko; his Gunvor oil trading group controls the new Ust-Luga oil terminal on the Gulf of Finland, to which increasing crude oil volumes have been directed by Transneft, cutting tanker shipments out of Primorsk by more than 20% this year, compared to 2012. Primorsk was merged with Novorossiysk in 2011. Because of the competition from Ust-Luga, Primorsk is now loading tankers at its lowest volume in more than five years. The bigger game, politically, is for the circle around President Vladimir Putin to diminish the financial resources of the circle around Medvedev, and prevent his challenging again for the presidency, or even retaining the prime ministry. 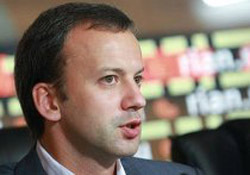 Commercially, the strategy of the state companies is to oust Magomedov, and refocus Novorossiysk port on oil exports instead of the diversified cargo business model Magomedov has favoured; in addition to oil and petroleum products, that includes sugar, wheat, steel, cement, and containers. For more details of Magomedov’s troubles, which started when Medvedev was demoted by President Vladimir Putin, read this. At present, USC owns a 30.1% shareholding of the shipyard company; 65.18% is owned by NCSP, control of which has been divided into equal 25% shareholdings between Transneft and Summa Capital. The port company’s financial reports reveal little about the operating and asset value of its shipyard unit. Virtually nothing has been invested in the yard, compared to other units, in the $64.4 million in capital expenditure NCSP reported for last year. If the goodwill calculation in NCSP’s last annual report is a fair basis, the asset value of the yard is just under 1% of the entire company’s value. Given today’s market capitalization of NCSP’s London-listed shares at $1.6 billion, the entire yard may be worth less than $15 million, and the stake for acquisition at less than $10 million. Another valuation, reported by leading maritime analyst in Moscow, Alexei Bezborodov, puts the shipyard value at about $45 million. USC, according to industry sources, wants to modernize and expand the yard to service the most advanced of the Russian Navy’s surface fleet, plus diesel electric submarines. Unluckily for Magomedov, the effect of the Georgian war of 2008, followed by NATO warmaking in Libya and Syria, as well as recent regime change in Egypt, have made a forward base for Russian naval fleet support a strategic objective, compared to which Novorossiysk port’s wheat and steel shipments to the Middle East are subordinate. In May Putin ordered consideration of the options for navy repairs on the Black Sea coast. Late last month, the Marine Board, a cabinet-level policymaking group, heard presentations on only one option – conversion of the Novorossiysk yard — by USC chief executive Vladimir Shmakov and Navy commanders. USC executives claim the transfer of ownership of the Novorossiysk Shipyard has been accepted “in principle”, but officially USC will not confirm. “We do not comment on it,” Summa spokesman, Evgeny Timoshinov, responded. Summa has already announced that it supports the parallel development of the yard, combining ship repairs and the transhipment of dry cargoes, mainly ferrous metals and cement, with one berth dedicated to roll on-roll off operations. In 2012 the yard handled about 30% of NCSP’s ferrous metals volumes, or 1.6% ($16.5 million) of the group’s total turnover. “On the negative side,” warns Irina Stupachenko, maritime analyst for Otkritie Capital in Moscow, “refocusing on ship repairs may result in a reduction of ferrous metals handling, which is a high-margin cargo for NCSP.” She adds: “NSY’s potential sale is negative for its long-term development prospects,” noting that the port company is short of land and has been planning to move more ferrous metals handling to the yard, creating more space in turn for extra container volumes elsewhere in the port area. 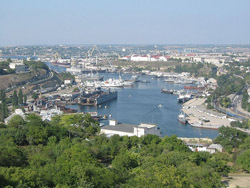 According to an analysis by Bezborodov, there is already a perfectly adequate naval shipyard at Sevastopol (right), and no technical reason why the extra fleet repair requirements cannot be met there. Politically, though Russia and Ukraine agreed in 2010 to extend the Russian lease on the Sevastopol base until 2042, the parallel development of a new naval base at Novorossiysk has also been decided. Servicing for the second of Russia’s new Mistral-type amphibious assault carriers, named the Sevastopol, appears likely to be established at Novorossiysk, not at Sevastopol.